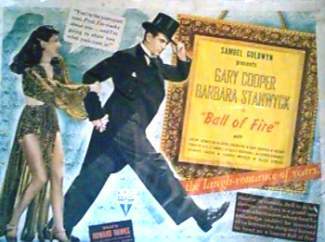 A poster from Howard Hawks' BALL OF FIRE (1941) in which she played nightclub singer "Sugarpuss" O'Shea opposite encyclopedia professors Gary Cooper, Henry Travers and S.Z. Sakall among others. This farce co-written by Billy Wilder also features Dana Andrews and an Oscar-nominated score by Alfred Newman. Stanwyck received her second Best Actress nomination for this film. 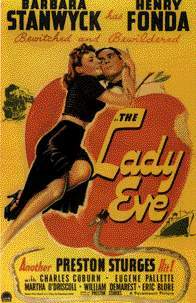 A poster from Preston Sturges' THE LADY EVE in which Stanwyck "bewitches and bewilders" Henry Fonda as both Jean Harrington and Lady Eve Sidwich. This screwball romantic comedy also features Charles Coburn, William Demarest and Eugene Pallette. 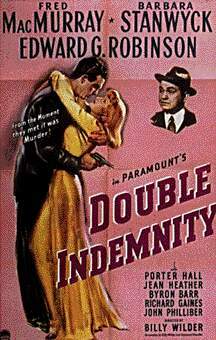 A poster from Billy Wilder's DOUBLE INDEMNITY (1944) in which Stanwyck co-starred with Fred MacMurray and Edward G. Robinson. Stanwyck received her third Best Actress nomination for her role as Phyllis Dietrichson in this film-noir classic. "Mrs. Dietrichson" (clip) from DOUBLE INDEMNITY (1944) by Miklos Rozsa (a .MP3 file). 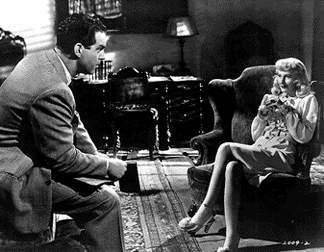 Hear some seductive dialogue between Stanwyck and MacMurray in DOUBLE INDEMNITY (a .WAV file). "Speeding" with Fred MacMurray (a .AVI file courtesy Universal Pictures). 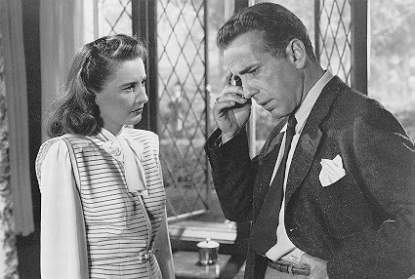 With her psychopathic artist and murder husband Humphrey Bogart in THE TWO MRS. CARROLLS (1947). Incidentally, this movie was filmed in 1945 but not released until March 1947 (for a reason unknown to me). 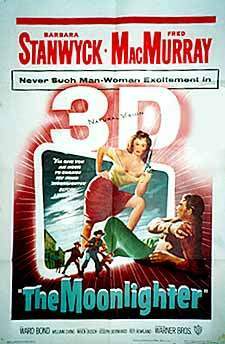 A poster from the third of Stanwyck's four films with Fred MacMurray, THE MOONLIGHTER (1953) a 3-D western featuring Stanwyck as Rela, MacMurray's ex-girlfriend, and a screenplay by Niven Busch. "Sorry, Wrong Number" (clip) from SORRY, WRONG NUMBER (1948) by Franz Waxman (a .MP3 file). Barbara Stanwyck by Al DiOrio (New York: Coward-McCann, c1983). The films of Barbara Stanwyck by Homer Dickens; foreword by Frank Capra (Secaucus, N.J.: Citadel Press, c1984). Stanwyck by Jane Ellen Wayne (New York: Arbor House, c1985). Starring Miss Barbara Stanwyck by Ella Smith (New York: Crown Publishers, 1973). The Hollywood West: lives of film legends who shaped it edited by Richard W. Etulain & Glenda Riley (Golden, CO: Fulcrum Pub., c2001). Femme Noir: The Bad Girls of Film by Karen Burroughs Hannsberry (Jefferson, NC: McFarland & Co., 1998). Hollywood lesbians by Boze Hadleigh (New York : Barricade Books, c1994).